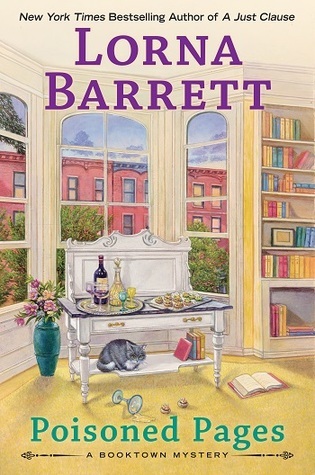 Poisoned Pages by Lorna Barrrett is the twelfth book of the Booktown Mystery series. In this book, Tricia is having a housewarming party in her newly refurbished apartment. At the party, one of the party goers is killed when poisoned by something he ate. It's up to Tricia to figure out who did it and why. I really enjoyed this book. Going back to Stoneham was like visiting with old friends. I could see myself shopping in Haven't Got a Clue, visiting with Pixie and Mr. Everett. I would go to Booked for Lunch for a great meal while watching Tricia having lunch with Angelica. The characters add warmth and wit to the story. They are one big family. The mystery is exceptional. It is a mystery within a mystery. There were secrets and a great who-dun-it that will keep you guessing. I couldn't stop reading until I got to the end and found out the answers to all of the questions. It kept me riveted until the end. I would recommend this book to anyone who loves a great who-dun-it with twists and turns that will keep you guessing along the way, and characters that are warm, witty and have a family feel. I would also recommend readers to check out the first eleven books of this series. They are wonderful reads that will grab you from the first page to the last. I love this series so much.